Okay, so we were a little surprised to hear that Beyoncé gets her nails done in the East Village, but Brendan Bernhard might not have been. In his latest essay, he points out that ours is a neighborhood that caters to the body. Susan Keyloun The nail paint at Susan Nail & Spa at 149 Avenue A.
It’s one of the things I love about the East Village (and miss when I’m gone): the amount of attention to which your body can be paid (if you’re willing to pay for it) on almost any street. 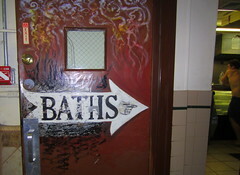 Take the venerable Russian & Turkish Baths on East Tenth Street between First Avenue and Avenue A (forever and ever the hottest place in the neighborhood in the literal sense), where in under twenty minutes, a lifetime’s worth of clogged pores can be brutalized into unleashing rivers of salt.